Meet the Made runs through August 31, 2008. The current session of the Factory 14s Youth Art Course has started a blog. Head on over to http://mattressfactory14s5.blogspot.com and check out what they're up to! 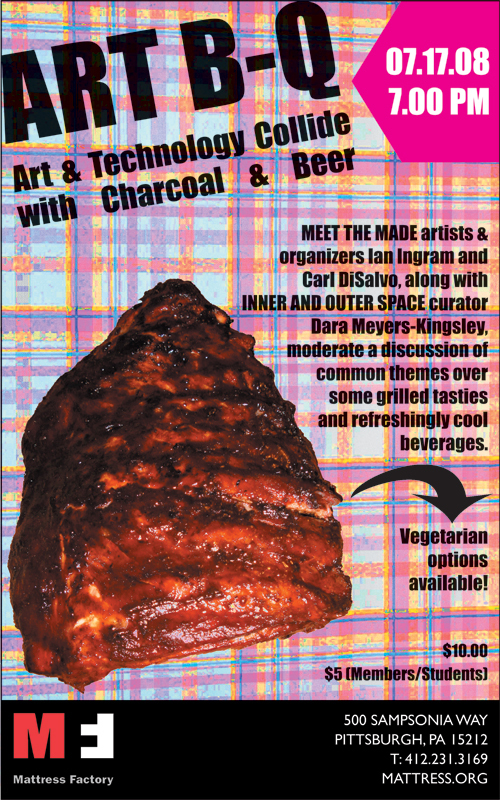 Art & Technology Collide with Charcoal & Beer. prototype for an infinite array of semi-autonomous percussive devices (a.k.a. Crickets) will be on view through August 10, 2008. 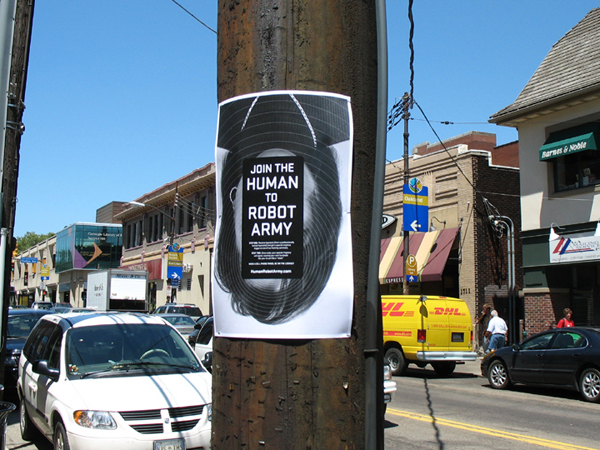 WE WANT YOU FOR THE HUMAN TO ROBOT ARMY!!! You are invited to a free and friendly hypnosis session at the Mattress Factory this Friday. During these sessions you will be hypnotized into thinking that you are robot by specialist John Weir from the Pittsburgh Hypnosis Center. Each session will last about 20 minutes and they will begin at 6:00pm and 6:30pm. Come to the Meet the Made exhibit at 1414 Monterrey Ave in the Mattress Factory Annex to receive further instructions. Working with scientists at Carnegie Mellon and Yale Universities, Strachan created a rover that inhabits an other-worldly diorama inside the Museum and communicates with the outside world through data transmission. Inspired by the landscape of the North Star Polaris, Strachan created a charred, coal-covered landscape where this exploratory robot roams. Named Robbie after Robert L. Lawrence, the first African-American astronaut killed during training, the rover is seen as an autonomous being by the artist, living a lonely life on a dead star. Strachan has created a sentient being that has its own intelligence and the ability to sense itself and the world around it. Communicating to the command center in the Museum parking lot, Robbie transmits data about itself and the interior landscape. The command center’s main task is to house the controls for the rover, being outfitted with an 8-channel data receptor, satellites and antennae and computers. There is also automatic feedback—so that the command center both receives Robbie’s data and sends signals to the rover every five to seven minutes. Robbie is encountered through a mediated image in the command center; we can see through the eyes of the rover, and yet we are allowed to be observers in the diorama on the third floor. Conjoining viewer with scientist, no one is a passive viewer. Strachan is, however, questioning what we think we know and what we think we see, and yet reminding us of the reality that we exist in an infinite universe. The variety of rocks that form the diorama are carbon-based. By including coal in this work, Strachan makes the connection between here (Pittsburgh) and now (current time), and there (the dead star of Polaris 541 light years away). The work is a proposal for an actual rover that may be created some day. This project for the Mattress Factory is the theoretical underpinning for the idea. Strachan begins his exploration in the context of art and eventually these ideas and art projects may enter the real world. Strachan is currently engaged in a long-term project entitled The Orthostatic Tolerance (“orthostatic” means to stand upright, and “tolerance” refers to the ability to withstand pressure) to begin his mission into outer space and to the bottom of the ocean. Training to become an astronaut, Strachan is hoping to carry out one of the first missions—by a Bahamian—to leave the planet. NY Times Spends 36 Hours in Pittsburgh. The travel section of yesterday's New York Times contains a glowing review of the Steel City. The MF was highlighted as a must-see destination for "radical contemporary art," and Luca Buvoli's Instant Before Incident is described as "a riveting sculpture...that depicts a vintage Fiat in stop-action motion, as it seems to hurl out the window." A nice image of Yayoi Kusama's Repetitive Vision accompanies the feature. Read the whole story HERE.